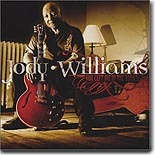 Jody Williams was last year's exciting new rediscovery in the blues world. He's back again with his second CD, and it's just as strong as the first one. It's this month's Pick Hit. Soul/blues singer Charles Wilson finally found a record label that was sympathetic to how he wanted to produce his CD, and the result is the stunning If Heartaches Were Nickels, our Surprise pick for July. The soundtrack to the groundbreaking documentary Deep Blues, from 1992, is hard to find in print, but certainly well worth the search. It's featured as this month's Flashback. This month's What's New section features new releases from Paul Oscher, Quinn Golden, Marion James, Shirley Brown, Stacy Mitchhart, Big Daddy G, Midnight Rhythm Combo and jazz organist Tony Monaco, plus a re-issue of classic recordings by Doc Watson (yes, there's blues stuff here!) and a host of DVD reviews.